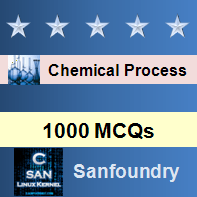 This set of Chemical Process Calculation Multiple Choice Questions & Answers (MCQs) focuses on “Enthalpy – I”. Explanation: H = U + PV. Explanation: H = f(T, P). Explanation: Cp is the change in enthalpy with respect to temperature at constant Pressure. Explanation: For ideal gases, Enthalpy and Internal energy is only the function of Temperature. 5. Enthalpy has no absolute value. Only changes can be calculated. Explanation: Enthalpy is calculated with respect to a reference, there is no absolute value. Explanation: Cp – Cv = R.
Explanation: T1 is the melting temperature. 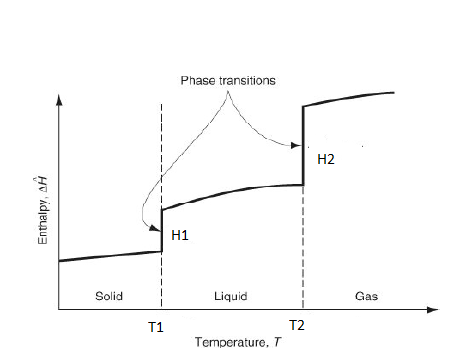 Explanation: T2 is the vaporization temperature. Explanation: H1 is the heat of fusion. Explanation: H2 is the heat of vaporization.